KIEV, Ukraine -- As the cease-fire between Ukraine and Russia looks shaky at best, the prime minister of Ukraine told CNBC that Russia was not withdrawing heavy weaponry from the east of the country and needed to end its "illegal invasion." Ukraine Prime Minister Arseniy Yatsenyuk. "I have a key aspiration, and this is the aspiration of the entire Ukrainian nation: Russians, get out of our land. 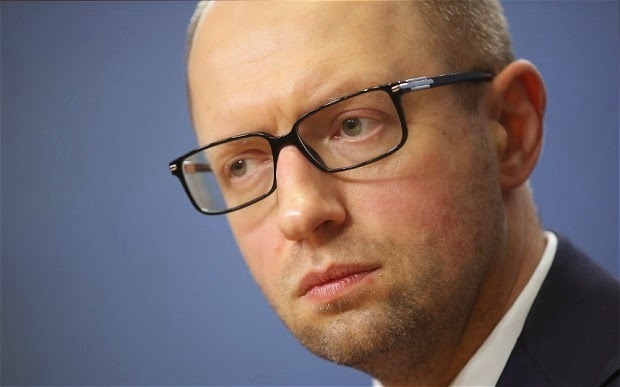 But they are still in Ukraine; Russian military and boots are still on Ukrainian ground," Ukraine Prime Minister Arseniy Yatsenyuk told CNBC Tuesday. Less than two weeks ago, Russia and Ukraine signed a peace deal, brokered by France and Germany, which was meant to see the withdrawal of heavy weaponry by both sides from the eastern region of Ukraine, where fighting between pro-Russian separatists and the Ukraine military has been concentrated. Speaking of the deal, Yatsenyuk alleged that Russian President Vladimir Putin had "cheated and outplayed" those involved in peace talks, including Ukraine President Petro Poroshenko, the leaders of France and Germany who helped broker the deal, "and the entire European Union." Although he said he supported Poroshenko's efforts to try to find a solution, and that peace was needed for Ukraine and for the "free world," he added that Putin presented a "threat to the entire western civilization." The conflict, which started last spring, prompted the West to impose economic sanctions on Russia, which is believed to be supporting the rebels despite denying involvement. More than 5,800 people have died in the fighting so far, according to the United Nations. In an effort to show they were honoring the truce, pro-Russia separatists Tuesday invited reporters to witness the withdrawal of heavy weapons from the front line in east Ukraine, as agreed under the cease-fire deal. But Ukraine accused the rebels of using the cover of withdrawal to reinforce for another advance, Reuters reported. Speaking to CNBC in Kiev, Yatsenyuk said he was wary about Russia's intentions and that Russian President Vladimir Putin was not abiding by the ceasefire deal, known as "Minsk 2" as it was the second attempt to find a peaceful solution to the conflict. "The Russian president hasn't executed any deal - either 'Minsk one' or 'Minsk two' - and Russian aggression severely affected Ukraine," he said, adding that he was "absolutely sure" the Ukrainians who wanted to join Russia had been affected by "Russian propaganda." "This is not about the aspirations of some Ukrainians who still believe they have stronger links with the Russian Federation. This is Russian propaganda, and Russian illegal annexation and the illegal invasion of Ukraine. And Russia misused these people to legitimize it's invasion and annexation of Crimea," he said. Crimea, in the southern part of Ukraine, was annexed by Russia following a referendum last March, although the vote is disputed by Ukraine which says Russia illegally seized the region. Vadym Prystaiko, deputy foreign minister of Ukraine, told CNBC that Ukraine's 46 million population would like to know "what is in Putin's mind and how far he's going (to go)." "What we know for sure is that he will go and grab as many lands as we will allow him," he told CNBC in Kiev Tuesday. "We don't know whether he wants to stop at some point." He reiterated Ukraine's desire to reintegrate the Crimean region back into wider Ukraine. Ukraine's economy has been hit hard by the ongoing tensions, and the International Monetary Fund (IMF) approved a $40 billion financial aid deal for the country earlier this month, although it depends on certain reforms being implemented. In terms of military support, the U.S. has said it was considering arming Ukraine, although Europe is wary of such a move. On Tuesday, however, U.K. Prime Minister David Cameron said British military personnel were to be sent to Ukraine to provide training and advice to the Ukrainian troops. Yatsenyuk said he was confident that, with the help of the West, Ukraine could rid itself of Russian forces. "My primary target is to get peace in my country, to pull back Russian forces, to restore the territorial integrity and the independence of Ukraine. Is it doable? Yes, if we act…with our Western partners," he said. Greatly covered the news Nicholas.